To watch a young, wingless praying mantis jump is a truly remarkable thing. The jump from take-off to landing lasts less than a tenth of second--literally faster than the blink of a human eye. During a jump, the insect's body rotates in mid-air at a rate of about 2.5 times per second (see video of praying mantis jump at link provided at end of this article). And yet, according to researchers who report their observations in the Cell Press journal Current Biology on March 5, 2015, the mantises' jumps are precise. When mantises jump, they land on target every time. The Current Biology article is entitled “Mantises Exchange Angular Momentum Between Three Rotating Body Parts to Jump Precisely to Targets." "This is akin to asking an ice skater who is rotating at the same speed as these mantises to stop suddenly and accurately to face a specific direction," says Dr. Malcolm Burrows of the University of Cambridge. Dr. Burrows, along with Dr. Gregory Sutton of the University of Bristol, came to study praying mantises quite by accident. After buying a few mantises at an amateur entomology show, the researchers brought them back to the lab. Those insects started breeding, and the researchers became intrigued by the mantises' jumping behavior. "We could not scare them into jumping or get them to jump away from a threatening stimulus," Dr. Sutton says. "So instead we offered them a target to jump towards and found that they would do this consistently and accurately." The question then was: How did they do it? To find out, the researchers watched high-speed video after video--381 in all--of 58 young mantises jumping to a thin black rod. What the researchers saw was this: in preparation for a jump, first the insects sway their heads sideways, scanning for their targets. In an open-access review article published on Febraury 26, 2015 in the journal Clinical and Translational Medicine, researchers from Boston University School of Medicine (BUSM) shed new light on the underlying processes of tumor metastasis and highlight the role of epigenetics in this process. By comparing embryogenesis with cancer metastasis, the scientists hypothesize that reversible epigenetic events regulate the development of different types of metastatic cancers. They also describe that the surrounding cells of the tumors (stromal cells) play a significant role in this process. The BUSM researchers support the hypothesis that metastasis is more of a gradual process, leading to a heterogenic tumor population with cells of various epigenetic and differentiation statuses. 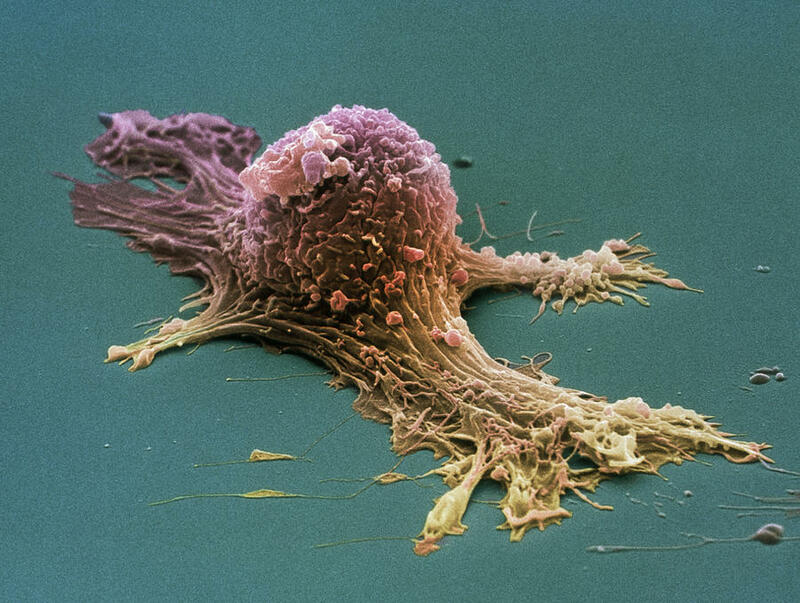 They propose that cancer progenitor cells slow their growth while differentiating into more metastatic forms and then resume rapid division once the cells have metastasized to certain state or grade. Similar processes again take place when that grade of metastatic cancer changes to another grade. As this process is not a one-time event during tumor metastasis, the slowing of growth and increase in differentiation must happen many times. Once the desired grade is achieved, the reverse process needs to take place. Epigenetics is what allows the cells to transform reversibly. In accordance with this hypothesis, metastasized tumors of various types and prognoses demonstrate known epigenetic markers. Localization and growth of the metastatic tumor cells in distant location is another important event in tumor metastasis. Cancer patients fear the possibility that one day their cells might start rendering many different chemotherapy regimens ineffective. This phenomenon, called multidrug resistance, leads to tumors that defy treatment. Now, scientists at The Scripps Research Institute (TSRI) in La Jolla, California, have published a pair of studies showing how the primary protein responsible for multidrug chemotherapy resistance changes shape and reacts to therapeutic drugs. “This information will help us design better molecules to inhibit or evade multidrug resistance,” said TSRI Associate Professor Qinghai Zhang, a senior author of both studies. The findings were published recently in two papers: a March 3, 2015 study in the journal Structure, co-led by Dr. Bridget Carragher, a Professor at TSRI with a joint appointment at the New York Structural Biology Center; and a March 2015 study in Acta Crystallographica Section D, co-led by Dr. Geoffrey Chang, Professor in the UC San Diego Skaggs School of Pharmacy and Pharmaceutical Sciences. The proteins at work in multidrug resistance are V-shaped proteins called ABC transporters. ABC transporters are found in all kingdoms of life—from bacteria to humans. In humans, an important ABC transporter is P-glycoprotein (P-gp) (image), which catches harmful toxins in a “binding pocket” and expels them from cells. The problem is that, in cancer patients, P-gp sometimes begins recognizing chemotherapy drugs and expelling them, too. Over time, more and more cancer cells can develop multidrug resistance, eliminating all possible treatments. “Virtually all cancer deaths can be attributed to the failure of chemotherapy,” said Dr. Zhang. To design more effective cancer drugs, scientists would benefit from a better understanding of P-gp and how it binds to molecules. From a practical standpoint, the wiring of the human eye - a product of our evolutionary baggage - doesn't make a lot of sense. In vertebrates, photoreceptors are located behind the neurons in the back of the eye - resulting in light scattering by the nervous fibers and blurring of our vision. Recently, researchers at the Technion - Israel Institute of Technology have confirmed the biological purpose for this seemingly counter-intuitive setup. "The retina is not just the simple detector and neural image processor, as believed until today," said Dr. Erez Ribak, a professor at the Technion - Israel Institute of Technology. "Its optical structure is optimized for our vision purposes." Dr. Ribak and his co-authors described their new work during the 2015 American Physical Society March Meeting (http://www.aps.org/meetings/meeting.cfm?name=MAR15), on Thursday, March 5, 2015, in San Antonio, Texas. Dr. Ribak's interest in the optical structure of the retina stems from his previous work applying astrophysics and astronomy techniques to improve the ability of scientists and ophthalmologists to view the retina at high detail. Previous experiments with mice had suggested that Müller glia cells, a type of metabolic cell that crosses the retina, play an essential role in guiding and focusing light scattered throughout the retina. To test this, Dr. Ribak and his colleagues ran computer simulations and in-vitro experiments in a mouse model to determine whether colors would be concentrated in these metabolic cells. They then used confocal microscopy to produce three-dimensional views of the retinal tissue, and found that the cells were indeed concentrating light into the photoreceptors. "For the first time, we've explained why the retina is built backwards, with the neurons in front of the photoreceptors, rather than behind them," Dr.